After doing some new reading from the Microsoft Hardware Dev Center, I am making some changes to my recommendation for UEFI Partitions. In the next few days I will be adding a few posts related to Partitions and Windows 10, and pointing out some major gripes with Microsoft. Let’s just say I have 0 confidence that Microsoft’s Windows, Hardware, Server, MDOP DaRT, and Config Mgr teams even discuss these things, so my recommendations will NOT be in line with Microsoft’s. 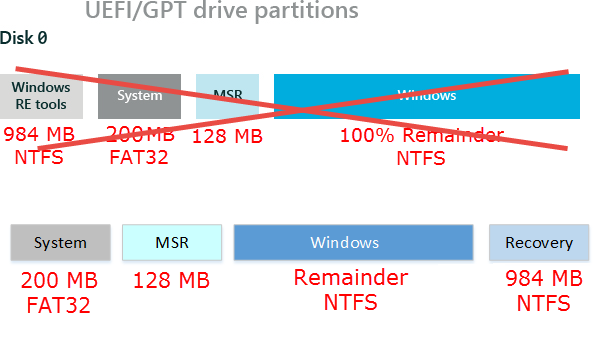 The updated graphic below will show my UEFI Partition recommendation, and I will detail in the coming days why these are accurate.